Guests do not receive complimentary parking. Enter via North Bridge Rd pedestrian entrance at junction of Raffles Hotel and Raffles City. Turn left at Toast Box and walk 50m. Before Harry’s Bar, take a right turn and take the first lift on your right to L2, or the stairs directly opposite the lift. Upon exiting the lift, turn left and you will see the main entrance to the restaurant on your right. Enter via Stamford Rd pedestrian entrance located directly opposite the Raffles City Office Tower entrance. Turn right at Dimbulah Cafe and walk 50m. 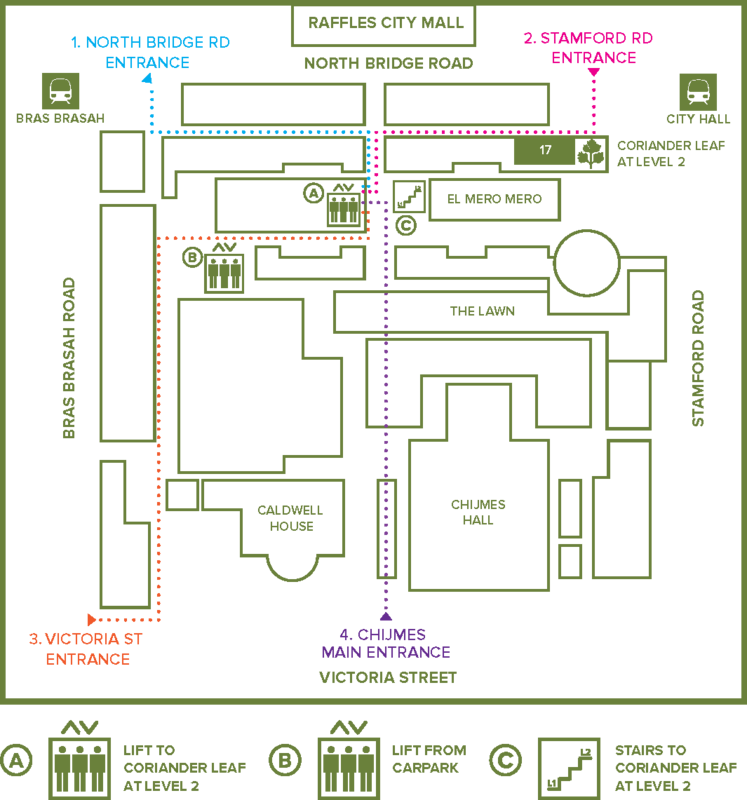 After Harry’s Bar, turn left and take the first lift on your right to L2, or the stairs directly opposite the lift. Enter via the Victoria St pedestrian entrance at the corner of Bras Basah and Victoria St. Turn left and walk all the way straight for 150m till you see the disabled ramp next to Tonkatsu by Ma Maison. Turn right and walk up the disabled ramp. Walk straight down the corridor and the lift lobby to Coriander Leaf will be on your left, just before the entrance to El Mero Mero. Alternatively you may take the stairs directly opposite the lift. Cut directly across the main CHIJMES courtyard and look for the lift lobby to the left of El Mero Mero’s entrance on the ground floor. Take the Passenger Lift to L1. Upon exiting the lift, walk straight and turn left towards the direction of El Mero Mero. The lift lobby to Coriander Leaf will be on your left, just before the entrance to El Mero Mero. Upon exiting the lift at L2, turn left and you will see the main entrance to the restaurant on your right.